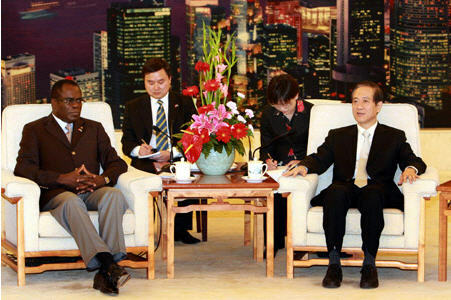 During the meeting, Vice Chairman of the Standing Committee of China's National People's Congress (NPC) Han Qide said China enjoyed traditional friendship with the DRC, and attaches importance on the cooperation and friendship with it. The Chinese side is willing to work with the DRC and strengthen bilateral reciprocal cooperation, so as to serve the two peoples, Han said. He said the exchange between the two countries' legislative bodies is of great importance in boosting mutual understanding and trust, as well as promoting a further development of the friendship and cooperation of the two countries. Mokolo said DRC cherished its friendship with China, always adheres to the one-China policy and supports the unremitting efforts of the Chinese people for a peaceful reunification. He also expressed the willingness for further developing the relationship between the NPC and the DRC senate. The delegation is invited by the Chinese People's Institute of Foreign Affairs.